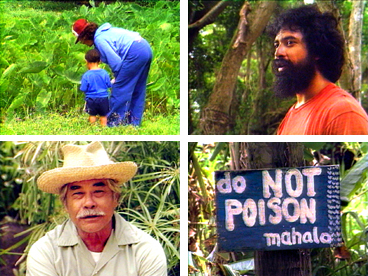 Hosted by well-known kupuna Eddie Kaanana, this video focuses on traditional Hawaiian values regarding the precious resource ka wai, fresh water. The respect for water sources such as streams and springs and the use of stream water from mauka to makai (mountain to sea) is discussed and contrasted with modern-day practices. Featuring farmer Keoki Fukumitsu, who depends on the clean, cool stream water to grow the staple food of Hawai’i, kalo (taro).